Wed., Aug. 15, 2018, 3:27 p.m.
COSTA MESA, Calif. – Melvin Gordon got into an argument recently with a fan who insisted he was Todd Gurley. The Los Angeles Chargers’ durable running back doesn’t look a whole lot like his Los Angeles Rams counterpart. That didn’t dissuade the fan, he recalled with a grimace. Heading into his fifth season in the Chargers’ backfield and his second year in LA, Gordon is poised to make sure everybody knows his name this fall. Gordon got better as last season went on for the Chargers, becoming fresher and more dangerous during their late surge into the playoff race. Looking back, Gordon realizes he improved because he got healthier – so he took steps to make sure he would be fresh from the start of training camp for the grind of the regular season. Gordon stayed away from the Chargers during part of organized team activities this year, altering his offseason preparations to keep himself fresh. 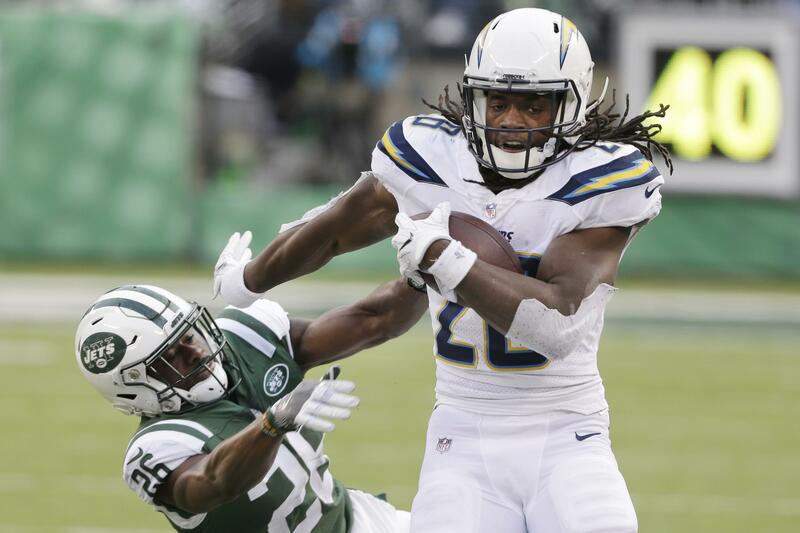 He picked up a nagging knee injury early last season while pushing himself to impress first-year coach Anthony Lynn, and his season picked up speed only when the knee began to heal. His final five games of the season were outstanding, and he finished as the NFL’s seventh-leading rusher with a career-high 1,105 yards and eight touchdowns. Gordon credits his improved health for the surge, but also his mental toughness. Gordon has steadily evolved as a versatile back in his four NFL seasons since leaving Wisconsin. He also caught 58 passes for 476 yards last year, and he didn’t fumble all year until the season finale. Along with his improved health, Gordon also expects to get a boost from the addition of center Mike Pouncey, a punishing run-blocker for the Miami Dolphins for the past seven seasons. The Chargers had one of the NFL’s worst yards-per-carry averages last season (3.8), and Pouncey could be a key to unlocking longer runs. “The way he gets to the second level for those blocks, it’s crazy,” Gordon said. The Chargers already picked up Gordon’s fifth-year contract option for 2019, but he knows the upcoming season will have a major impact on the length and size of his next contract – and he isn’t afraid of the scrutiny. Gordon realizes that his optimism and enthusiasm can be contagious for the Chargers, but only when he’s healthy and productive. After appearing in all 16 games last fall for the first time in his career, he’s hoping for production to match Gurley or any other running back who kind of looks like him this fall. Published: Aug. 15, 2018, 3:27 p.m.